It's a miracle how my home repair and remodel chores while having a job as a cook, turned into a full time home remodeling and real estate investing business. Here are 16 home repair and remodel projects I've done that save me money and prevent damage on my houses. Use the index of links below to see about the projects on this page. Roof leaks can cause the most home repair and remodel expense from a leaking roof and damaged shingles. 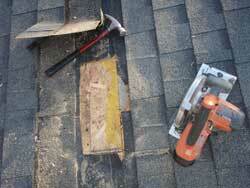 The photo shows a roof shingle repair where a missing tab on the shingle caused a small piece of the wooden roof deck to rot. I notice the problem from a water stain on the ceiling drywall inside the house. you'll be able to see missing shingles after a storm and can take measures to replace those missing shingles quickly. Be safe! See construction safety when doing your home repair and remodel projects. It would be safer to get three estimates and hire your roof inspection and repairs to a qualified contractor. Ask questions or contribute your suggestion for home repair and remodel in answers to questions. Please support my sponsors - Thank you. Find local ratings on who to hire in your area for all your home projects, find the best at Angie's List. Save Money on Your Water Bill! A $.50 cent rubber washer or o-ring can save you hundreds of dollars in a years time. If you have one leaky faucet, there's a possibility your other faucets could be leaking too. Usually you don't have to replace the faucet, replacing the washer or o-ring will save you money. Many of the faucet repair kits include the instructions so you can do it yourself. You can tell when the toilet is leaking when you hear the water running in the toilet when its not in use. Try the colored water test. A couple drops of food coloring stirred in the toilet water holding tank will show up in the toilet bowl without flushing. If you see a small stream of colored water leaking into the toilet bowl, the toilet flapper is not sealing properly or worn out. Replacing the toilet flapper is easy to do. The instruction are included when you buy a new flapper and only takes about 5-10 minutes to install the new flapper. Did anyone ever ask you if your toilet is running? I try to add some humor to my home repair and remodel work, it makes sometimes hard work much easier and a lot more fun. Dampness or corrosion on the water pipes. Copper, PVC, Galvanized, and PEX, are the types of pipe. All can leak from old age, improper installation, or accidental damage. Repair or replace as soon as possible. A small leak in a water pipe can easily break or burst causing extensive damage. A leaking water pipe is wasting water that you pay for on your water bill, or with electricity running a well pump. The old water meters have a small red triangular dial that spins when the water is flowing. The new digital water meter no longer has that feature to check visually for water flow. Water Meter visual Test on old water meters. Turn off all the water in the house, check the little red dial to see if its spinning. Any movement on that water meter dial will indicate water is flowing or leaking. If it is, look for water leaks as mention above. The old style basement windows are single pane glass in a steel or wood frame. The window panes are glazed into place with putty that cracks over time and will leak air into the house. covered with cardboard, wood, or plastic. I recommend replacing old basement windows with new glass block windows. You can have glass block windows custom made to fit or, many construction supply stores have pre-made glass block windows to fit standard size basement window openings. Glass block windows are heavy and removing the old steal window frames can be hard work! Installing new basement windows are worth the effort for a significant energy savings. and a variety of glass block designs to choose from. Many of our home repair and remodel project materials include manufacturer installation instructions. Glass block window instructions can be found on the bag of glass block mortar mix, and in the packing slip of the glass block windows. You can also call the manufacturer for installation instructions so you can do it yourself. Allow yourself an entire weekend for 5 to 6 windows. New replacement windows save more energy than adding insulation inside the walls of an old house! I found a substantial savings in energy when I replaced my old windows with energy star windows. I did not notice much of a change with energy savings from blowing insulation inside the walls. 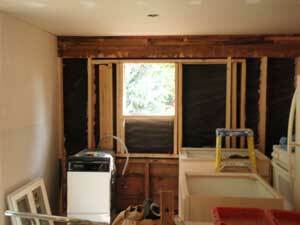 With my old house remodeling projects, blown insulation in the walls is a last choice for me. For real estate investing, new windows can be seen and are a high consideration for my home buyers. Out of site - Out of mind. insulation or a weather guard can be added at that time. Keep your windows locked or latched during heating and cooling seasons to save money on your energy bill. Check your caulking joints around your exterior and interior doors and windows every year. Interior caulking cracks on the inside of of the house windows will let the air in and increase your utility bills during the hot and cold seasons. Exterior caulking cracks not only let the air in, rain water and moisture can seep behind the trim and cause wood rot and mold. Insects love to make their homes in those little cracks in the caulking. Insects, spiders, bees, will nest inside the walls and eventually find their way inside your home. and the rain water from leaking inside the walls. Screens have one major purpose - Keep the bugs out! Screens also come in different colors for custom home designs and solar screens block the the Sun's heat and keeps the house cool. Keep the Bugs and Insects Out... And the Fresh Air In. A few bugs aren't bad, but left unchecked, insects will enter into your home, nest, and multiply relatively quickly. For a quick fix, check your hardware and building material stores for screen patches. Screen patches come in a small pack with about 5-2" x 2" screen repair pieces to cover small holes. For do it yourself screen repair. Very simple to do, yet very often over looked. It's unfortunate for a homeowner to get a $75.00 service call bill when their furnace or air conditioning fails to work and the only problem was a dirty furnace filter. Furnace filters are fairly inexpensive depending on the type you buy. I recommend the pleated filters that have more surface area than the flat furnace filters. Hepa (High Efficiency Particulate Air) filters cost more and in my opinion, worth the extra money to keep the air in your home clean and fresh. Check your furnace filters every month, it only takes a minute. To save time, buy a few extra filters to keep on hand for quick and easy filter changes. Electronic Air Cleaners should be checked every month as well. They have a pre-filter just like the standard furnace filters without an electronic air cleaner and need to be changed to maintain the efficiency of the electronic elements. Old and dirty duct work can be a cause for continuous furnace filter cleaning or replacing, plus an added risk for health problems. Pets in the house; dogs, cats, and other furry friends will cause some level of pet dander floating around in your indoor air and settling in the duct-work. There is the health advantage for duct cleaning to decrease the amount of dust, pollens, mold, and pet dander that could be difficult for people with asthma and other health problems. Sick building syndrome is described where building occupants experience health and comfort effects that are linked to spending time in a building where no specific illness or cause can be pinpointed. Airborne building contaminants may be that cause. See a video at my friend's website We Clean Ducts to see how your ducts can be cleaned. Over time, mortar joints will crack, weather, and deteriorate. Similar to cracks in caulked seams and joints, cracks in your brick, block, and stone masonry construction will cause moisture and water to leak into the wood or interior structure of your home. Insects, bees, and our pesky little friends love these tiny crevices to build their nests, that again, will find their way into your home. Tuck pointing requires removing the old mortar, and replacing with new mortar to re-seal the masonry work, and to maintain the structural integrity of the building. A quick fix would be to use a mortar caulk in a tube to fill smaller cracks. I recommend tuck pointing when large sections of mortar are missing or the mortar is at the deterioration stage of easily crumbling to the touch. Peeling paint on the exterior of the home has more of an affect than just eye appeal. Bare wood exposed to the Sun and weather conditions will quickly deteriorate the wood. Insects love raw wood for a good meal and eat away at the bacteria found in the decomposing wood trim, siding, decks, and fences. Exterior painting requires proper preparation of cleaning, scraping, and priming before new exterior paint is applied. Consider the new lead based paint EPA-RRP Rules on painting projects inside and the exterior of your home to protect you and your loved ones from the toxic affects of the poisonous lead based paint. and will prolong the life of your deck. I stain my decks every two-years even though most stain products claim to last 5 to 10 years. When re-staining with the same color, I can skip the balusters and side rails to every other staining application. The stain will last longer on vertical surfaces. and regular exposure to the morning dew. Man made composite decking materials may hold a stain longer and some are colored completely through the board from top to bottom. The materials are initially more expensive, but claim to recover the extra expense from the maintenance free (or less maintenance) features of the decking material. Clogged gutters will overflow the rain water to the ground near your house foundation, footings, or basement wall. The spill-over rain water will also splash onto to the house siding material, possibly causing a faster rate of deterioration depending on the exterior building materials. Cleaning gutters allowing the water to flow freely to the down spouts, and directed the water away from the home's foundation is the intended purpose of having gutters. Gutter maintenance will also prevent water backing up under the first few rows of shingles and leaking behind the gutter onto or behind the fascia boards. Gutters at the downspout penetrations and gutters with seams use a butyl gutter caulking type adhesive and sealer to prevent leaks. I have found over the decades, if not sooner, those joints and downspout connections eventually leak. Gutter cleaning and maintenance to prevent leaks and directing the rain water flow away from the house is simply part of the routine, annual, home maintenance schedule. It may be wiser to do the annual gutter cleaning maintenance than to be shocked with the damage to footings, siding, roofs, and fascia that leaking or clogged gutters can cause. Home remodeling is quite a bit more extensive than home repair. New counter top, sink, disposal, and appliances. Check remodeling kitchens or look under Projects in the left column NavBar for more home remodeling projects. Your questions are important to me on Ask The Rehabber.com. Ask Your question here (Plus, you can add your answer and expertise to our Visitor's questions) Rehabber Answers to Questions.